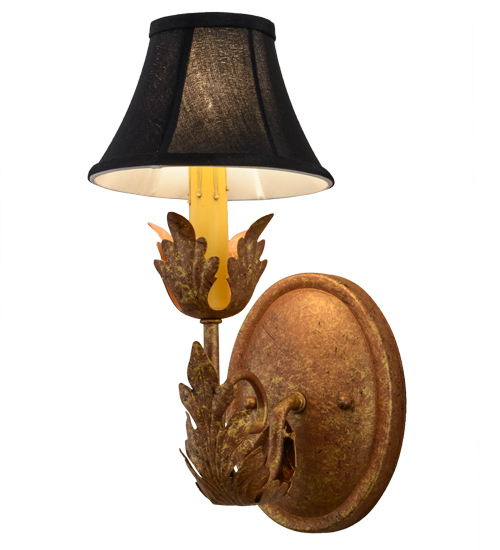 Description: Luxurious elegance is defined by the Esther Wall Sconce, which features an Amber faux candlelight crowned with an Ebony Textrene shade perched on floral styled bobeches. The exquisite frame, hardware and Acanthus Leaf accents are offered in an Autumn Leaf finish. Handmade in the USA, this wall sconce is available in custom sizes, designs and finishes, as well as dimmable energy efficient lamping options such as LED. The 13-inch tall sconce is UL and cUL listed for dry and damp locations however we do not recommend installing it in spaces that experience a large amount of moisture.